(NaturalNews) Speaking on a radio program, Kyoto University assistant professor Hiroaki Koide commented that the Fukushima Daiichi nuclear power plant has become like a swamp filled with radioactive material. Koide was referring to the fact that, ever since the meltdowns triggered by a March 2011 earthquake and tsunami, the Tokyo Electric Power Company (TEPCO) has been relying on a constant influx of water to keep the plant cool. The process of flowing past the reactors renders the water radioactive, however, so radioactive water has been accumulating at the plant for years. In that time, multiple leaks have caused the contaminated water to spill into the surrounding area, creating a sort of radioactive swamp. Koide said that he has been calling on TEPCO for a year to shift from using water for cooling to using air. The company insists that that is impossible, as it does not know the exact locations of the melted down fuel rods inside the plant. Water has been at the heart of TEPCO's problems keeping the failed plant shut down since day one. During the initial meltdown, the company funneled large amounts of seawater past the melting down reactors as an emergency cooling mechanism. This corroded sensitive equipment and many of the valves and pipes used for cooling the plant. Leaks have been springing up ever since. In addition to the radioactive cooling water, groundwater has also started seeping into the basements of the reactors, where it, too, becomes radioactive. TEPCO has been pumping the contaminated water out of these basements and storing it in giant tanks, or simply ejecting it into the Pacific Ocean. Although TEPCO claims that the radiation levels in the water are low enough that dumping it in the ocean will not cause any harm, the company's own tests have shown radiation levels above the safe exposure threshold set by TEPCO. 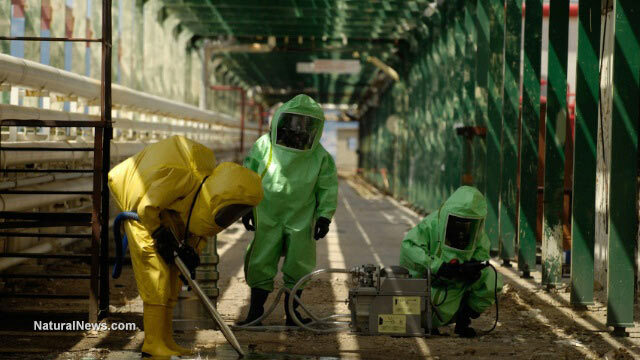 The vast quantities of radioactive water accumulating on-site are a significant threat to the health of workers attempting to clean up the plant. They are also interfering with the cleanup operation itself. For example, a series of underground trenches connecting the turbine buildings for reactors 2 and 3 have been filling up with contaminated water leaking into them from nearby containment vessels. Eventually, these trenches will fill up, and the water will spill into the surrounding environment. The Nuclear Regulation Authority called this possibility the "most serious source of concern" and has ordered TEPCO to remove all the water from these trenches. But 11,000 tons of radioactive water are not easy to move, and the amount of water in the trenches is growing every day. To address both of these problems, TEPCO has attempted to construct an "ice wall": a network of pipes surrounding the trenches, through which a subzero coolant will be piped, in order to freeze the trenches solid. Coolant began flowing on April 28 and was supposed to freeze the trenches within a month. But as of July 8, no ice walls had yet formed. TEPCO claims that the procedure is failing because too much water is flowing around the connecting joints of the pipes. The failure to freeze the trenches is widely viewed as an ominous sign for TEPCO's much more ambitious plans for a 1.5 km (0.93 mile) -long, 30 m (100 ft) -deep ice wall completely encircling the number 1 and 4 reactors, to prevent any more groundwater from flowing down into the buildings' basements. The larger ice wall is intended to be operational in March, but work is proceeding slowly. Due to their heavy radiation-proof clothing, workers can only be out between 5 pm and 11 pm without risking heat stroke.